Despite being one of the best areas in the continental United States to live the “surf lifestyle,” Santa Cruz is a coastline of many moods and faces—a far cry from the consistently powerful and perfect surf playground that it’s portrayed as in the media. This makes equipment choice critical. 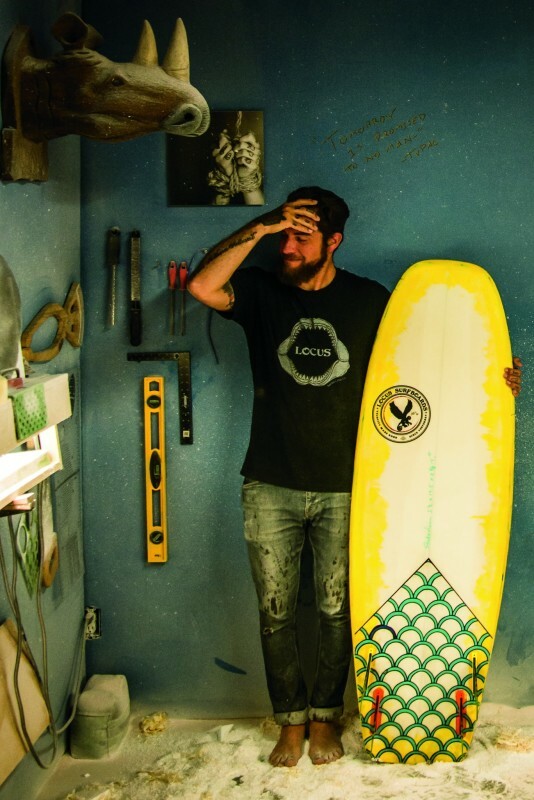 An additional hurdle for the eco-conscious is that the town’s surfboard-building industry, while a local treasure with numerous, expert craftsmen, is not always environmentally sustainable. From the chemicals and waste that goes into manufacturing, to the way consumers dispose of their toxic toys, surfboard shaping can be quite the dirty deed. With these two truths in mind, Tyler Hopkins of Locus Surfboards designed the Shakedown: a “planing-hull” design that mixes the ease of riding a Mini Simmons with the high-speed maneuverability of a standard shortboard. Planing hulls such as the Mini Simmons are designed to run on top of the water at high speeds, and are typically very flat at the tail. This shape allows riders to achieve higher speeds with greater ease, yet sacrifices the maneuverability and responsiveness of a standard shortboard. The Shakedown draws on the best elements of planing hulls (like the Mini Simmons) as well as modern-high performance shortboards, creating a versatile hybrid that works well in a range of swells, from 1-foot slop to punchy beach breaks and shallow reefs. Hopkins sees the Shakedown as a missing link in any local surfer’s quiver—and an eco-friendly one at that. Each board is hand shaped using recycled EPS foam and glassed with bio-based epoxy resin. Amid mid-summer sunshine, Waves tasked Hopkins with describing his experimental yet versatile green surf-craft. Tyler Hopkins: I’ve been working on the Shakedown for about three years, and after a lot of testing and team feedback, we have arrived at something special. The Shakedown is a high performance-planning hull. Designed to be a great fit as a daily driver, its straight, parallel outline and overall width pulled in much closer to a more contemporary shortboard design, this model produces a ton of projection and drive. As a result, the Shakedown must be ridden 6-12 inches shorter than your standard shortboard, allowing the rider to easily overpower this down-the-line drive. The bottom has mid-entry rocker and low, drag reducing tail rocker, coupled with single to double concave through the tail. Designed to be ridden as a quad, the Shakedown also performs well as a twin with wide based keels. The Shakedown paddles great and requires little energy to pop up on a plane, producing speed effortlessly, allowing the rider to harness all that speed, rather than generating it. This makes surfing less-than-perfect conditions more fun, allowing intermediate to advanced surfers to perform maneuvers that are normally reserved for more powerful waves. These qualities also benefit beginner surfers who are transitioning to smaller boards. The Shakedown is great for tight, in-the-pocket surfing in punchy beach breaks, reef passes or long walled-up points and can glide easily through flat sections as well. 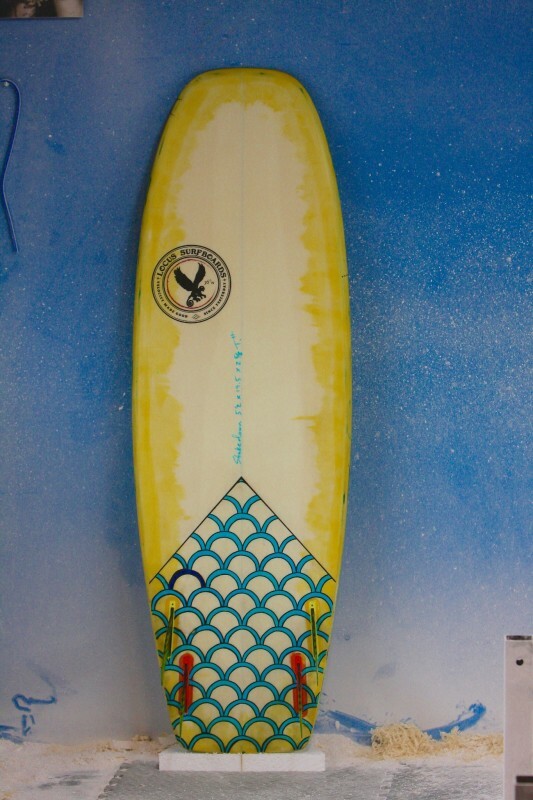 This model excels in surf in the 2-foot-to-6-foot range. [It is] hands down the most versatile model in our line-up. Learn more at locussurfboards.com. Contact Hopkins at locussurf@gmail.com or (831) 251-1521. This entry was posted in Art, Featured, Local Loop, Opinion, Spotlight, Surfing. Bookmark the permalink.